A bridge which is part of Moray’s flood alleviation scheme was officially named yesterday. 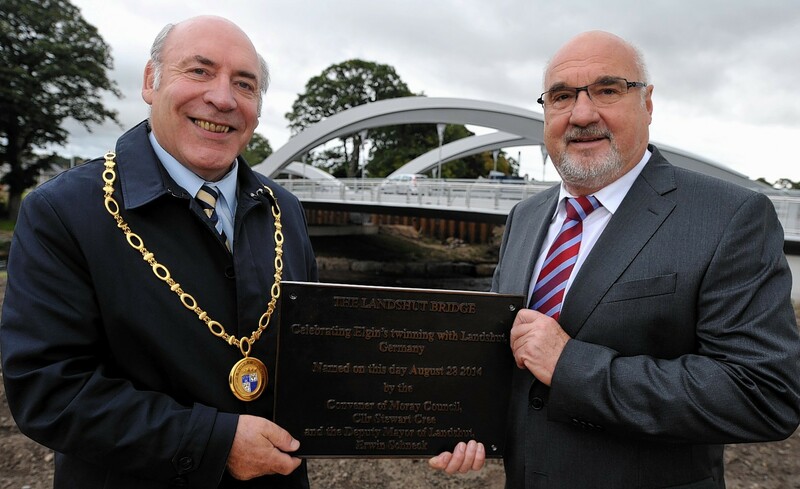 The former Pansport Bridge in Elgin was officially christened the Landshut Bridge by council convener Stewart Cree and Landshut’s deputy mayor, Erwin Schneck. A contingent of more than 40 people from the Bavarian town attended the ceremony, which marked the latest celebration of one of Europe’s oldest town-twinning unions — dating back to 1956. The £6 million structure is due to be completed early next year, and is designed to divert the flow of the River Lossie away from the old Brewery Bridge. Supporters from the twinning association, including the first ever Elgin student to study in Landshut, praised the bridge’s modern design yesterday. Moray MSP Richard Lochhead said the bridge will leave a lasting legacy for the twinned-towns. Herr Schneck said that the renaming of the bridge was a very positive gesture. Mr Cree said he was delighted that Moray Council decided to name the bridge after Landshut and described the structure as striking. “For Moray as a community that shares so many similarities with our friends in Landshut, this is an auspicious occasion,” he said. Herr Schneck said: “It is good that the bridge has been named Landshut. Lorna Patterson was the first pupil from Elgin Academy to take part in an exchange visit to Landshut, aged 16, in 1958. She went on to chair the twin town association and still plays an active role in the twinning union, which she said has captured her heart. “It’s the people that count. We stay in each other’s homes and the best way to get to know their way of life,” she added. “We are now the third generation of families exchanging, and there were three generations of our family in Landshut last year. “There were a lot of town-twinnings after World War II. “It was seen as a way to reunited former enemies, but too many of the twinnings are passee now. Mr Lochhead said: “The twin towning ties are all about building bridges.